Finely detailed tinted brass button measures 1 1/16" across. 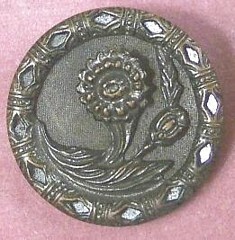 Center flower relief portion is slightly raised and is set off by a cut-through border which sparkles or "twinkles" because there is a shiny layer of tin sandwiched between the front and back of the button. Inserted metal loop style shank. Wear to black enamel on the reverse, as shown in photo.